How will the marketing models guide help me and my business? We believe that marketing models are powerful tools to aid thinking when reviewing strategic options and selecting the best future direction for a company. However, some are not well known or misused. We want to share these classic models so that marketers of all levels, from brand new students and seasoned professionals can apply them. With so many marketing models to choose from, it can be difficult to know which is the best to use in a specific situation. This free guide has been created to help today’s marketers apply our pick of the most popular established frameworks to aid their decision making. 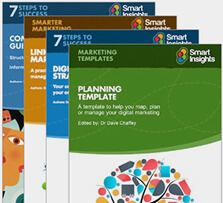 The guide contains 16 classic marketing planning frameworks to inform strategy development. Who is this marketing models guide for? Our guide was created as a reference for marketers creating marketing plans and studying professionals completing courses from trade associations such as the IDM, the CIM, and the American Marketing Association. Company owners and directors – Assess overall company goals and priorities to ensure a unified message is used across its marketing messages. Marketing managers, digital marketing managers – Evaluate current marketing efforts and make improvements that will have a direct impact on business-centric KPIs. Undergraduate and postgraduate marketing and business students will also benefit from reading this guide as it includes summaries of each concept as well as an example of how each model could be applied to a company. How is the marketing models guide structured? A simple explanation and diagram for each model. Examples of how, when, and why to use each model. What to watch for and best practice tips. Authors: Annmarie Hanlonand Dave Chaffey, with a foreword by Marketing Communications expert Chris Fill. Format: 20+ page download with two pages for each model explaining when it should be applied plus an example. Digital marketing models guide – After you’ve read our guide to essential marketing models, you may want to look at other options created specifically for digital aspects of your business. This guide will introduce you to 10 more models that you can use to inform the auditing, strategy, and planning of your digital marketing efforts. 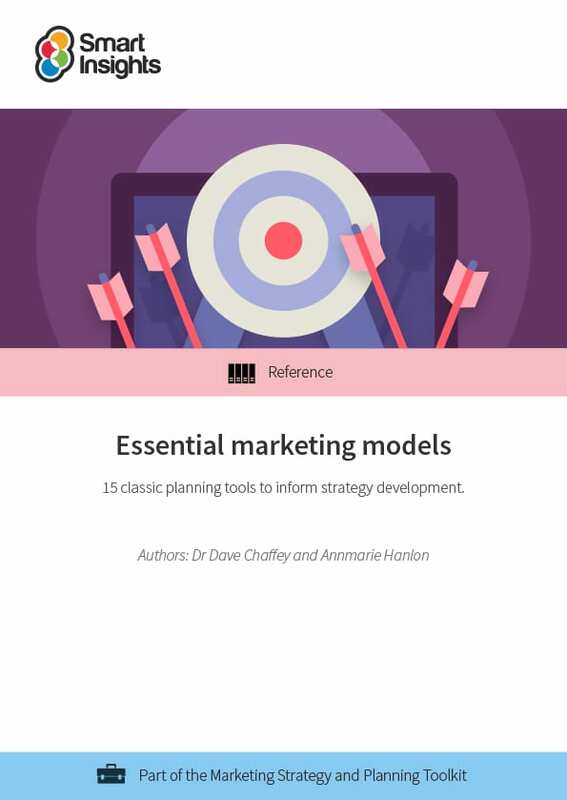 Marketing planning guide – If, after reading our essential marketing models guide, you’re ready to start planning, check out our comprehensive marketing planning guide. We’ll help you understand your customers, conduct a thorough marking audit, and set SMART objectives for your future. Dave is co-founder of Smart Insights. He is editor of the 100 templates, ebooks and courses in the digital marketing resource library created by our team of 25+ Digital Marketing experts. Our resources used by our premium members in more than 80 countries to Map, Plan and Manage their digital marketing.